This guide is designed to assist practicing structural engineers and other building design professionals to confidently develop conceptual structural designs for timber-rich buildings and structures. As many design professionals working on commercial scale structures are typically skilled with concrete and steel structures, this guide takes a whole-of-process approach to the selection of timber-rich structural systems. 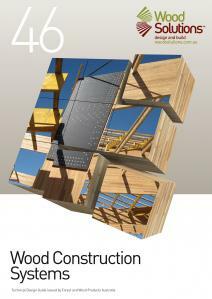 It explores available structural systems, connections and material options, and design approaches before providing a concise reference on the technical aspects of wood and timber products. It references other WoodSolutions Design guides and sources that can assist professionals developing their concept designs into detailed structural solutions. This guide is designed to assist practicing structural engineers and other building design professionals to confidently develop conceptual structural designs for timber-rich buildings and structures.